Keeping a fish tank is a hobby that has become more and more popular among pet enthusiasts. Whether large or small, a colorful fish tank sure makes your house more lively and fun. In order to keep the fish and plants healthy, you need to take good care of the aquarium tank. That means you need to clean all the messes in your tank, and as often as possible. There are more things in an aquarium tank that can affect the cleanliness and water quality than you might think. There are excess food, algae growth, dirt and other debris in the fish tank. Some of the pollutants are large enough for us to pick out by ourselves, but not all the pollutants are. To clean and purify the fish tank properly and regularly, you will need the help of a fish tank filter. Choosing the right type of fish tank filter can be difficult because there are so many options available on the market nowadays. Some of them are great products, while some others cannot really do the job as well as you would expect. In order to save you some troubles of having to go through some test failed products, today we’ll introduce and review one of the most popular and well-liked aquarium filter out there. It is the Fluval 306 External Filter. The Fluval 306 is not too large of a device. It is only 18 inches height, 10 inches length, and 7 inches width. In another sense, the device is only a little bit bigger than a palm of a hand. Even though it can be considered a small device, compared to other aquarium filters, it is a medium size. Thanks to that, the device can fit into smaller tanks while still being able to handle the workload of larger tanks as well. The Fluval 306 can handle the filtering job of an aquarium that is 12 to 70 gallons large. 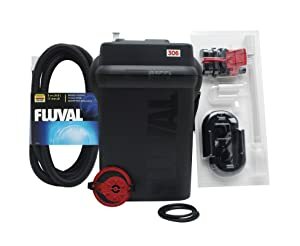 So in other words, for an aquarium as large as 70 gallons, you only need to use one Fluval 306 filter and it will efficiently take care of the job. Furthermore, the Fluval 306 is suitable for use with both freshwater and saltwater aquarium. So even with the extra salinity in the water, the filter can still have no problem being its usual efficient device. The device is not designed to only filter the water, but it is also designed to filter the water well. The filter is equipped with canister filters that do not only offer superior filtering capacity but also powerful flow rate. The canister filters provide superior filtration, which is ideal for both fresh and saltwater in a large amount. Canister filters normally maximize a device filtering capacity by taking advantage of their large filter body. 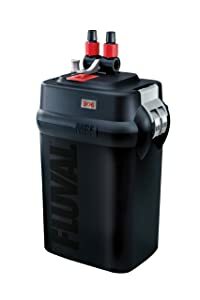 The Fluval 306 is designed to give the filter as much space as possible in the body for the filtering process to be the most effective. The Fluval 306 has three stages of filtration. This is one of the selling points of this product. The three media stages of the device include a mechanical, chemical and biological stage. The mechanical stage requires large capacity of space. This step uses up most of the space within the device. The vertical twin foam pre-filters absorb more debris and prevent clogged media in the filtering process. In the chemical and biological stage, the water is treated with chemical and biological processes. Both these two stages are placed in independent modules which allow easy and mess-free media removal for the water. These are also special features of this device. The AquaStop valves and the lift lock clamps are maintenance features that help not only keep the device function perfectly but also make it hassle-free to maintain it. The AquaStop valves help stop the water flow without having the owner disconnecting the hoses by themselves. Besides taking away some burden from the owners, these valves help eliminate leaks and mess as well. The Lift Lock Clamps help securely and quickly lock the motor housing in place. Even though this filter is a bit more expensive than other devices on the market, it can be worth it if its features are what you are looking for. It is hassle-free to maintain and generally pretty self-efficient to clean up and keep itself neat. Besides, all the filtration features are top-notch and efficient. It is one of the most well-liked and reviewed aquarium filters out there.